the Goats - spinningspidercreamery's JimdoPage! One of the things that makes Spinning Spider Creamery different from many other dairies is our focus on our goats. We are passionate about them. They are more like family members than livestock for us. Every doe has a name and a uniquely recognized personality. They are truly an extension of our family, not just here to provide the milk for our cheese. Like many dairies, we take great pride in the accomplishments of our herd. But we go a step beyond. We show competitively on both a regional and a national level. 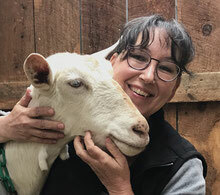 We are ADGA Plus members of the American Dairy Goat Association, participating in DHI (Dairy Herd Improvement or milk test) as well as appraising our goats annually. 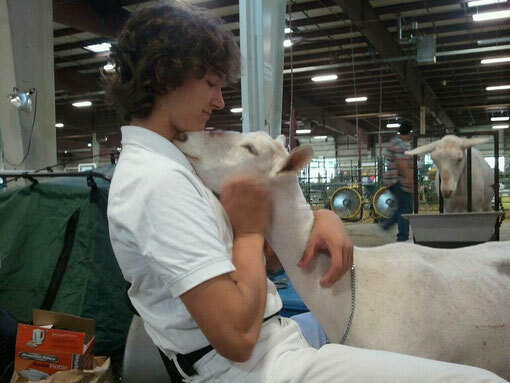 Our eldest son Cullen is an ADGA licensed dairy goat judge and a Linear Appraiser with the ADGA. Our herd is extremely healthy and we work hard to keep it that way. All our does work on the commercial dairy line. Even Heat Wave, our Saanen Breed Leader and 2018 National Show Total Performer came back from the national dairy goat show and went right back to work in with the milking herd instead of into a padded princess stall. We ask a lot of our does but we also provide them with the best environment possible.